Rock formations, sand dunes, a tangle of thorns, and other fragments of an impervious nature… The works of Francesco Simeti are visual archives of fractured bucolic tales and Arcadian landscapes. These seemingly disorganized fragments ultimately take shape in flourishing wallpapers where the human element is just a fleeting presence, ephemeral yet constant as a slow, unavoidable process of erosion. Not an invasion, but rather a mutation of the landscape. Not an inexplicable degeneration, not a mysterious disease, but the outcome of a wound deliberately left open, neglected. Simeti places the viewer in front of ambivalent scenarios, where the aesthetic gesture walks hand in hand with the desire to raise environmental awareness. Fascinated and intrigued by the unique habitat and the rural setting of the Bard College, with its campus buildings as varied as the local flora, Simeti has conceived and designed a site-specific installation. It is intended to highlight the contrast between the Upstate New York wilderness and the human presence there. At the same time, the artist questions the ambiguity of the relationship between form and content. Straying from his usual practice of blending and assembling illustrations, pictures and old photographs from image archives, for ‘The Bulletin Board’ Simeti starts from one of his existing wallpapers, and disassembles it. 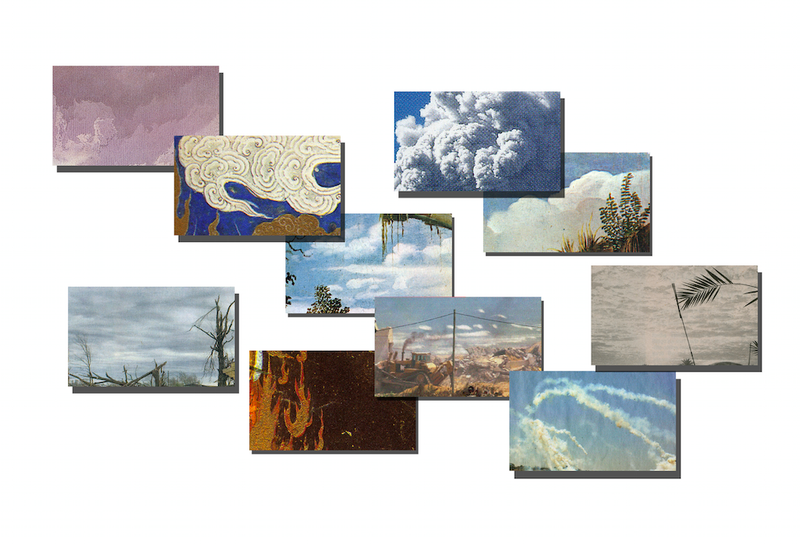 Parts of his landscapes are then printed on standard library index cards and pinned onto the corkboard. It is up to the viewer to pull together the pieces of visual information – as an archivist would do – and build his or her own imaginary narrative. The material pixilation of the work reflects the heterogeneity of the campus’ architectures and vegetation. That variance is likewise echoed in the selection of several different excerpts from writers who have illuminated the complex relationship between the Wild and the Human. These extracts, encompassing a wide range of authors from William Faulkner to Peter Matthiessen, have been selected by the curator and are printed in rotation on the back of each press release, as a supplement to the work.